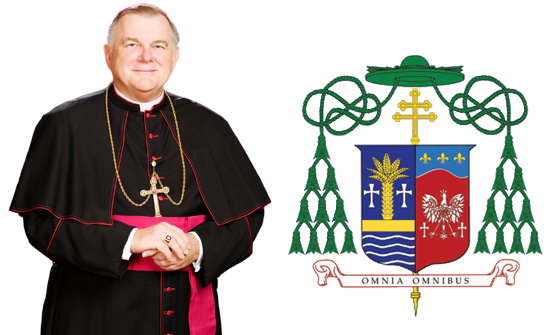 The coat of arms of Archbishop Wenski as Archbishop of Miami is a combination of his personal one with that of the archdiocese. As chief shepherd of the Catholic Church in South Florida, Archbishop Thomas Wenski is responsible for the pastoral care of more than 1 million Catholics worshiping in 105 parish communities and over 34,000 students learning in 62 Catholic schools in the archdiocese. The Office of the Archbishop has canonical and legal responsibilities associated with the administration of the Archdiocese. These are carried out at the Pastoral Center, which is located in Miami Shores. The Archbishop heads the Executive Office of the Pastoral Center and is assisted by the Chancellor for Administration, Chancellor for Canonical Affairs and the Vicar General.